The new Singapore government faced many urgent problems. One problem was that the different racial groups were used to putting their interests above others. 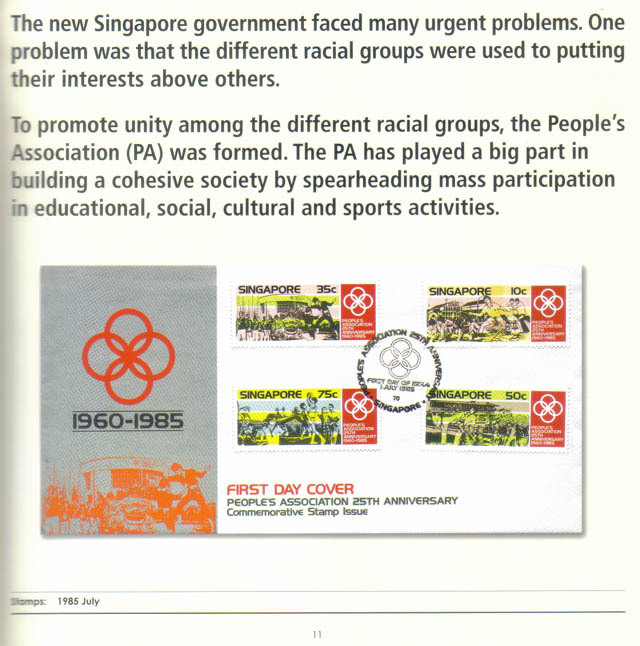 To promote unity among the different racial groups, the People’s Association (PA) was formed. The PA has played a big part in building a cohesive society by spearheading mass participation in educational, social, cultural and sports activities. 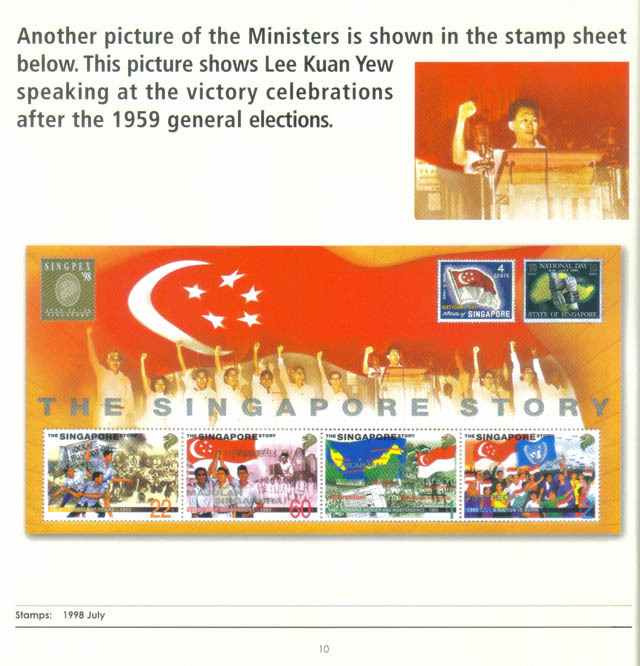 Another picture of the Ministers is shown in the stamps sheet below. This picture shows Lee Kuan Yew speaking at the victory celebrations after the 1959 general elections. General elections were held in 1959 to form a new government. The People’s Action Party (PAP) won 43 out of 51 constituencies. 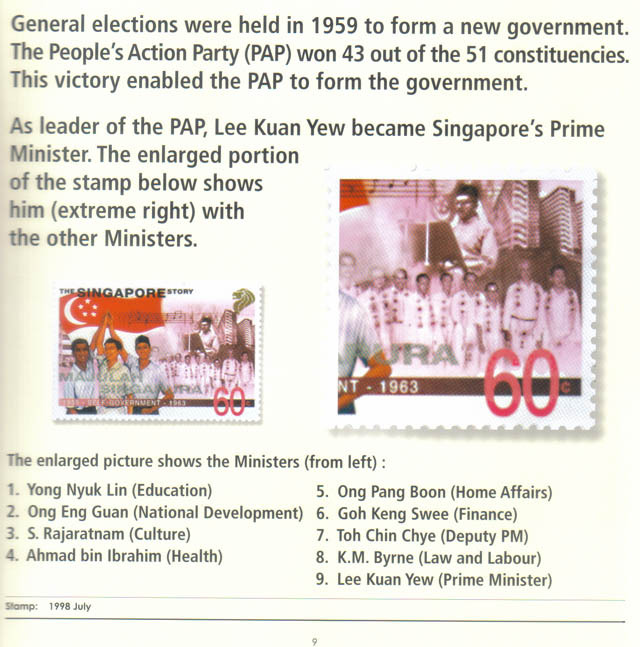 This victory enabled the PAP to form the government. As leader of the PAP, Lee Kuan Yew became Singapore’s Prime Minister. The enlarged portion of the stamp below shows him (extreme right) with the other Ministers. For some years after 1959, Singapore celebrated its National Day on 3 June. This date commemorated the change of status from colonial rule to self-government. 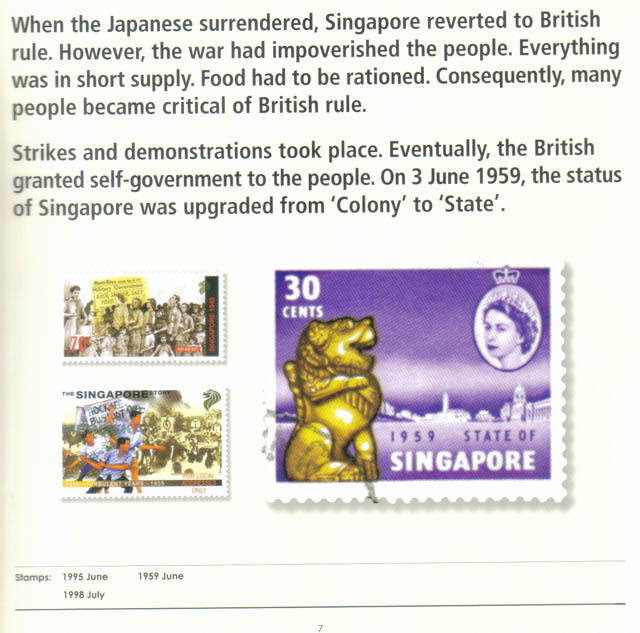 When the Japanese surrendered, Singapore reverted to British rule. However, the war had impoverished the people. Everything was in short supply. Food had to be rationed. Consequently, many people became critical of British rule. Strikes and demonstrations took place. Eventually, the British granted self-government to the people. 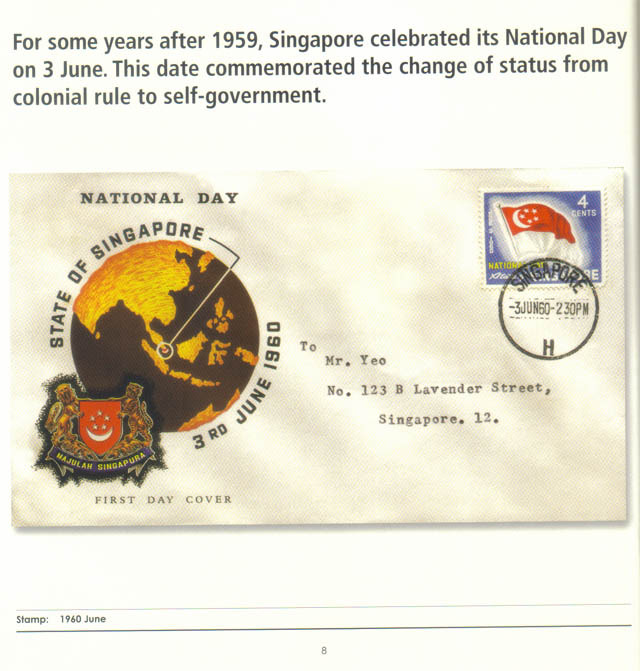 On 3 June 1959, the status of Singapore was upgraded from ‘Colony’ to ‘State’. The Japanese also went to war against America by bombing Pearl Harbour Naval Base in December 1941. The Japanese were finally defeated in 1945 when America used the atomic bomb to destroy the cities of Hiroshima and Nagasaki. 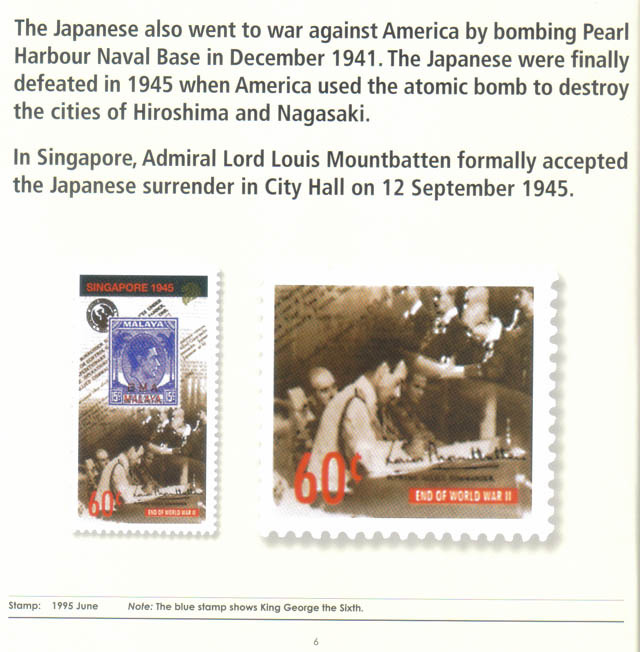 In Singapore, Admiral Lord Louis Mountbatten formally accepted the Japanese surrender in City Hall on 12 September 1945. Note: The blue stamp shows King George the Sixth. However, British involvement in World War Two (1939-1945) affected Singapore very badly. Japan, which had launched attacks on China, took advantage of the turmoil in Europe to attack the European colonies in Southeast Asia. 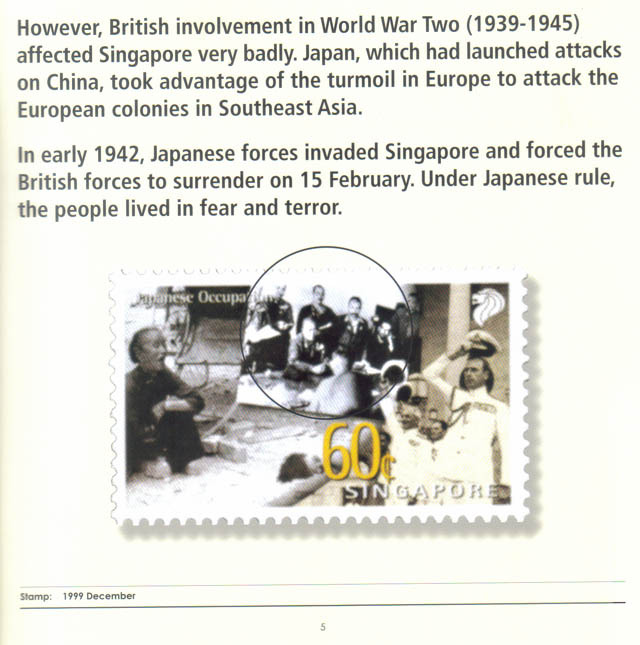 In early 1942, Japanese forces invaded Singapore and forced the British forces to surrender on 15 February. Under Japanese rule, the people lived in fear and terror.